After new federal regulations were imposed upon the food service industry, Alyn Scheatzle bought Morris Schiff’s wholesale meat business and became Schiff’s Restaurant Service, Inc. Initially the company concentrated only on cut meats and frozen foods, but has since expanded to include a full-service product offering including thousands of line items in fresh seafood, groceries, provisions, produce, chemicals, dairy products and equipment. After the acquisition of Scranton Foods, it was necessary to provide a separate business identity and expand our facilities to better serve the growing needs of our customers. Schiff’s Food Service, Inc. was incorporated as a separate entity and we relocated to our current facility in Taylor, Pennsylvania. 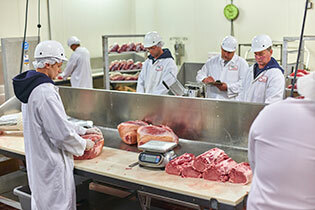 An USDA meat cutting facility was also added to provide the highest quality specialty meat cutting demanded by our customers. Since the relocation, we joined the Pocahontas Buying and Marketing Group. Our increased abilities enabled us to expand distribution to Northern New Jersey, Eastern Pennsylvania, and the Southern tier of New York State. Following a merger between Progressive Group Alliance and UniPro, we became an equity member in UniPro Food Service, Inc., the largest food service distribution cooperative in the United States, with over $66 billion in buying power which directly benefits you. The UniPro organization is the nation’s #1 food service distribution network for the industry’s leading national brands. This superior buying leverage is passed on to you. It is through this membership we can assure you the optimum variety of product, at competitive prices. At Schiff’s Food Service, we are supplying food service solutions in the tradition of past generations.